Today's travelers between New York City and Albany are more familiar with the Thruway than with the old Albany Post Road. 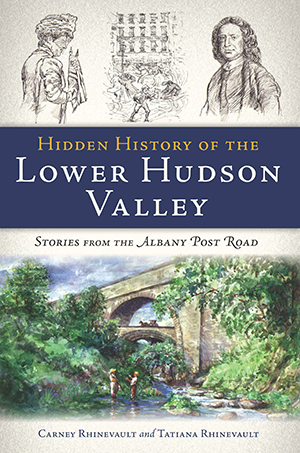 But for centuries, this was the main highway between the Big Apple and the capital, and many exciting events occurred along its path in the Lower Hudson Valley. The Dutch Philipse family of Sleepy Hollow engaged in piracy, and tales of such misdeeds from the region inspired Washington Irving to write some of his most beloved stories. Later, prisoners used the road as an escape route from the original Sing Sing prison. During Prohibition, a "beer hose" ran through Yonkers, allegedly placed along the route by beer baron Dutch Schultz. With illustrations by Tatiana Rhinevault, local historian Carney Rhinevault uncovers the stories hidden behind the old mile markers of the Albany Post Road. Carney Rhinevault is Hyde Park town historian and the author of The Home Front at Roosevelt's Hometown: Small Town America During World War II. He has researched thousands of deeds, wills, maps and other documents during a long career in surveying and cartography. Tatiana Rhinevault is a graduate of the Art Department of Moscow State University. She and her husband met while working together in 1990 on a joint mapping project for the U.S., British, Canadian and Australian embassies in Moscow.